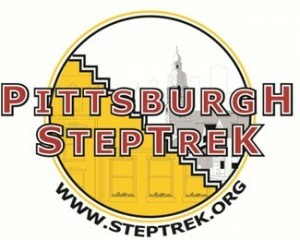 In its 17th year, the Pittsburgh StepTrek will begin Saturday, Oct. 7, 2017 at 11AM at South Side Park (Josephine & 21st Streets) on the South Side. The event has lasted this long due to the backing of individuals with a curiosity as to what lies at the top or bottom of the numerous public stairs in the neighborhood. The routes will take a tour of the hillsides and spectacular views that distinguish Pittsburgh. The family-friendly event combines photography, historic narrative and a sense of a neighborhood dependent upon steps. The Trek itself is self-guided. Each pre-registered trekker receives a map and a course narrative. The course narrative points out the landmarks and gives a history of the stairs and buildings, counts the steps and also provides instruction as to the route. Arrows along the course provide direction as well.